Natural Star Nani and director Indraganti Mohana Krishna are good friends. Ashta Chamma and Gentleman are two hits in their combination. Currently, Indraganti and producer KC Narasimha Rao of A Green Tree Productions are in the process of offering a laughter riot Ami Tumi to Telugu audience. 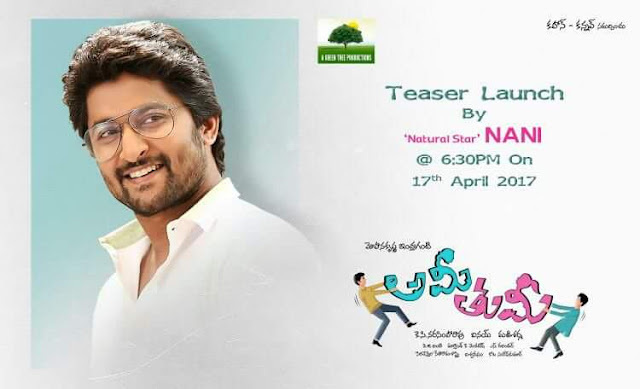 After amazing response for first look released, Ami Tumi teaser will be unveiled on 17th April by Nani on the occasion of Indraganti birthday. Starring Avasarala Srinivas, Adivi Sesh, Vennela Kishore, Esha, Aditi Myatal in main leads, entire shooting is wrapped up and post production work are in rapid progress. “The big occasion of Indraganti’s birthday will be celebrated with Ami Tumi teaser launch tomorrow on the hands of Natural Star Nani. Entire shooting of Ami Tumi is finished in 31 days using sync sound technology. We are presently in post production phase. After the nice reaction from audience for Ami Tumi first look poster, we are excited to roll the teaser out. Ami Tumi will grace theaters in the month of May,” said producer KC Narasimha Rao said. Ami Tumi is presented by Kahan and Kannav. Avasarala Srinivas, Adivi Sesh, Eesha Rebba, Aditi Myakal, Tanikella Bharani, Ananth, Madhumani, Kedar Shankar, Venu Gopal, Shyamala, Tanikella Bhargav, Thadivelu and others.